After the FACES/Lions November 2012 trip to Lambayeque, Peru, the two groups have been working together to apply for a grant to set up a sight and hearing program in northern Peru. 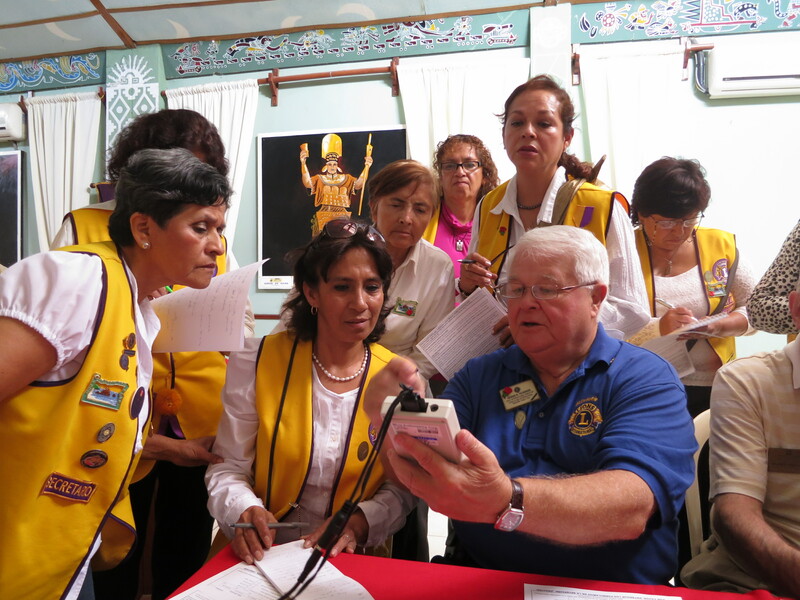 The Lions Club members spent much of their visit working with the women’s Lambayeque Lions Club (Ciudad Evocadora Lambayeque), training them on how to properly screen people with hearing and vision problems. They dedicated several days to teaching the club how to use the equipment (audiometers and rolling-E charts) and how to fit patients with new glasses. The goal of the trip and the training was to ensure the Peruvian Lions Club would be able to take over the project, and create a region-wide sight and hearing screening program, with a referral system, so that indigent patients would be able to obtain glasses and hearing aids. FACES is thrilled to announce that the team recently received a $5,000 matching grant from the Lion Club International Foundation. This $5,000 will go towards the purchase of several audiometers and vision testing equipments for the Ciudad Evocadora Lambayeque club. The team will purchase the equipment and bring it to Peru this fall, when it will be presented at a ceremony. The Portland-area Lions will conduct further training with the equipment to ensure it is maintained for long-term use. FACES would like to extend its warmest “thank you!” to the Lions Clubs, both in Portland and Peru, who have been a fantastic, dedicated partner to the FACES cleft lip and palate program for many years. We are looking forward to what the future holds, because we can do so much more together than we can alone.